Automation is your best friend. Avoid tedious manual data hauling from one system to another and focus on things that matter - your brand, your products, and your customers. Connecting Katana and QuickBooks Online keeps your orders synchronized in both systems. Prevent situations where figures in different softwares do not match. Your whole team will benefit and your accountant will love it. Track sales order statuses in Katana from a visual grid, and push invoices to QuickBooks in just one click. You can turn all your purchase orders in Katana into bills in QuickBooks in just a click of a button. All your customer and supplier information is transferred with invoices and bills from Katana to QuickBooks. No need to enter customer and supplier data manually. How Does the Katana × QuickBooks Integration Work? 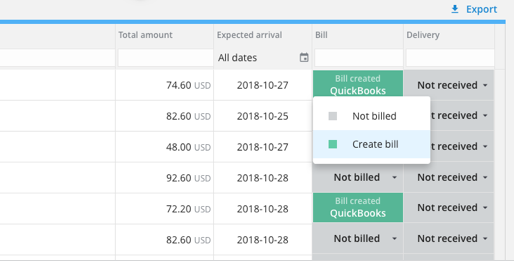 When QuickBooks is connected with Katana, you can create invoices and bills in Katana, which will automatically update your QuickBooks account. Clicking the created invoice or bill in Katana opens the document in QuickBooks. To create an invoice, select ‘Create Invoice’ from the ‘Invoice’ column in the ‘Sell’ screen. To create a bill, select 'Create Invoice' from the 'Invoice' column in ‘Buy’ screen. How to Connect Katana with Your QuickBooks Account? Sign up to Katana free 14-day trial and open the Settings - Integrations list. From there, you can connect your QuickBooks account. A short on-boarding wizard will take you through a couple of configuration steps and you are all set. Katana also has integrations with other e-commerce platforms and supports multichannel sales. Sign up now for better production & inventory management.